Near the Elliott Bay Trail, Seattle. Bike-to-work rates in major U.S. cities are not impressive. Only two have ever broken the 5 percent mark. In most cities, the rate is around 1 percent. But look more closely at the numbers, and you’ll see something interesting in the country’s bikingest cities: Their bike-to-work rates aren’t smoothly distributed. Instead, the middling citywide rates are generally possible only because a small number of workplaces are approaching Danish-level success in promoting bike transportation. That’s the situation in Seattle, currently the country’s No. 5 large city for biking to work. (The citywide rate is about 4 percent, or one in 25 Seattle resident workers.) But it’s not the situation everywhere in Seattle. As reported this month by the Seattle Bike Blog and Seattle Times, the top seven workplaces on this list — that is, all the ones with biking rates above 12 percent — have one striking thing in common. Every single one of them is located no more than one block from either a protected bike lane or an off-street path. Kelly Essmeier, 48, commutes on her bike every day, rain or shine, the four miles from her Magnolia home to the Allen Institute, where she works as a project manager. Usually using an electric-assisted bike (which can carry her kids as well, if necessary) she takes either the protected bike lane on Dexter Avenue or the new Westlake Cycle Track. A big chunk of bike commuters at the Allen Institute would ride their bikes no matter what, Essmeier said. Westlake Avenue’s protected bike lanes. Photo courtesy Seattle Department of Transportation. Street infrastructure isn’t the only factor. 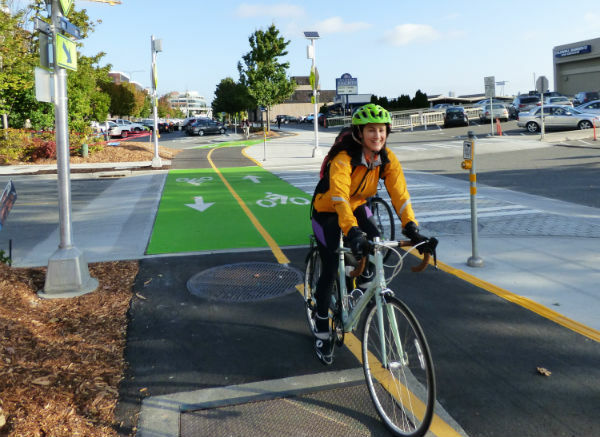 Commute Seattle also reports that the top large workplaces for biking all offer private amenities like showers and covered bike parking. And it’s also impossible to ignore that every leading company is primarily white-collar, full of employees whose desk work may leave them craving physical activity. But this data also suggests that bike infrastructure is more than just infrastructure. It’s advertising for the activity of biking. And just as the perfect biking city would have no bike maps because you could bike comfortably on every street, the decision to start bike commuting may be strongly influenced by how cognitively simple it is to figure out the route. Finally, this remarkable pattern of proximity to low-stress bikeways should teach us that when city leaders go looking for places that have made biking work, they don’t always have to travel to far-off states or countries. Sometimes, they only have to go a few blocks away.